In July 1911, Milton Ward, a native of New Brunswick, Canada, purchased from Henry Lovett 12 acres of land about a mile east of East Street Village on the south side of Pelham Road across from the Thayer farm, now part of the Amherst Conservation Area. Several months later, Ward submitted a plan to the Hampshire County Register of Deeds for a subdivision south of Pelham Road consisting of 65 lots, most of them 54 by 126 feet, to be divided between three streets named from east to west Ward, Thayer and Orient. Milton Ward, an independent carpenter and builder, immediately began construction of his own cast stone and frame home, 195 Pelham Road, on the east side of Ward Street and shortly thereafter on three other homes on that street. A few years later, he began building homes on Thayer Street. With the exception of Ward's original residence, the houses are of frame construction, the earlier ones in four-square style, the later in the bungalow style. Most of the Ward homes had front porches and a garage. They were heated by coal furnaces, had electricity and indoor plumbing and featured chestnut and pine woodwork. When a house was finished, it was either sold or used as rental property until a purchaser could be found. Milton Ward continued to build homes on both Ward and Thayer streets until 1927. By the time of his death in 1931, he had constructed only ten houses. His real estate holdings, including the Ward “homestead,” 185 Pelham Road to which he moved about 1920, were inherited by his children, Maud Carpenter of Los Angeles and Dana Ward of Somerville, Massachusetts. 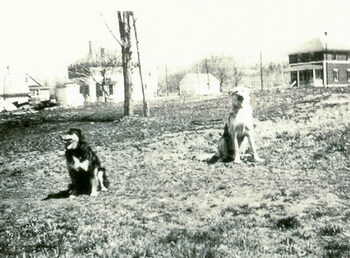 By 1942, Maud Carpenter had sold her interests in the subdivision, including the homestead. Dana Ward sold the last of the houses built by his father, 37 Thayer Street, in 1938. Between 1946 and 1953, he sold the remainder of the undeveloped property in the subdivision. During those years two houses were built on Pelham Road and two on Thayer Street by four World War II veterans, three of whom were brothers. In the early 1970s, a barn was moved from Pelham Road to the east side of Ward Street to make way for Bayberry Lane. The barn was converted to a home in the 1970s and around the same time a new house was built just to the north of it. The last house on Ward Street was constructed on the west side about 1980. In 1968, a new house was built on Pelham Road on the west edge of the subdivision. 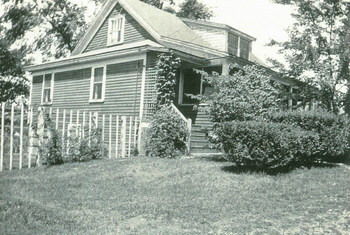 In the early 1980s, the final home in the subdivision was constructed set back from Pelham Road slightly to the east of the originally surveyed Orient Street. Although Orient Street remains on Amherst maps, it was never opened. Seventy years after Milton Ward began construction of his first house, the Milton Ward subdivision in East Amherst, consisting of nineteen homes each with grounds encompassing multiple lots, was complete. The residents of Milton Ward's subdivision have been primarily middle income families. Most of the employed adults have worked for local businesses, Amherst College and the University of Massachusetts, a few as faculty members. The majority of neighborhood children have attended East Street or Fort River Elementary Schools, Amherst Junior High School and Amherst (Regional) High School. The Milton Ward subdivision on Pelham Road, Ward, and Thayer Streets was and still is a very stable neighborhood. Many of the families lived or have been living in the same homes for fifty or more years.